Today I was preparing some materials for an upcoming visit from the staff of Millesgarden – the Swedish home of sculptor Carl Milles. As I gathered supplies for the visit, I was reminded of a fun picture I saw recently of Milles who served as Cranbrook’s sculptor in residence from 1931 to 1951. 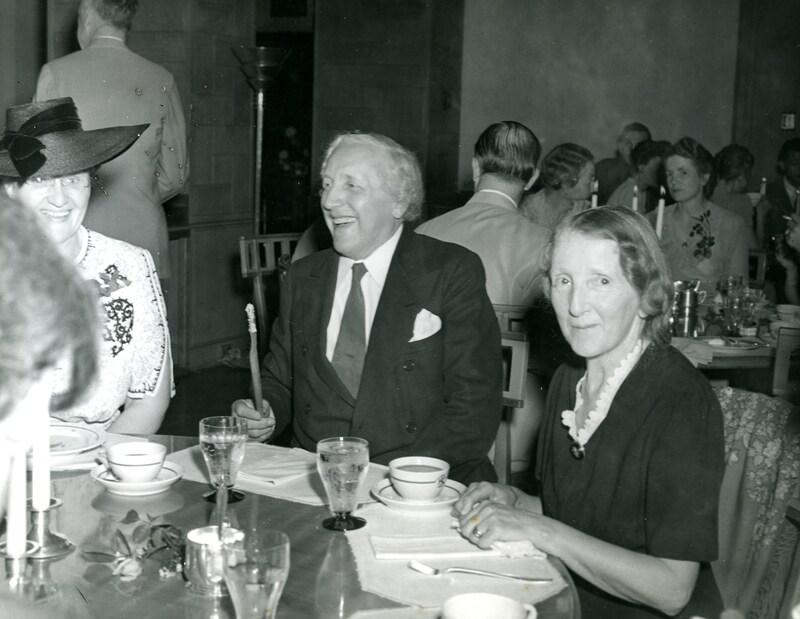 Carl and Olga Milles at Carl’s 70th birthday celebration, Jun 1945. Photographer, Harvey Croze. The picture is from Milles’ 70th birthday party, held in the Kingswood School Dining Hall. Milles seems to have been telling a joke and the photographer captured him mid-laugh. US Weekly, a bit of a “rag” magazine, has a section where they picture celebrities living “Just like Us.” Pictures of George Clooney buying batteries at the hardware store or Octavia Spencer waiting in line at Starbucks, living just like real people do. I thought of this Milles photo in much the same way; Carl Milles makes jokes at dinner, just like us! Archives staff works very closely with the Capital Projects department here on campus and we recently received an email from Project Manager, Craig Hoernschemeyer, about a possible Cranbrook connection with a poster he came across. The poster is of Norwegian Olympic ice skating champion, Sonja Henie, who won the gold medal in 1928, 1932 and 1936 and was also a film star in the late 1930s-1940s. Craig wondered if perhaps Henie could have been sculptor Carl Milles’ muse for the “Ice Princess”. 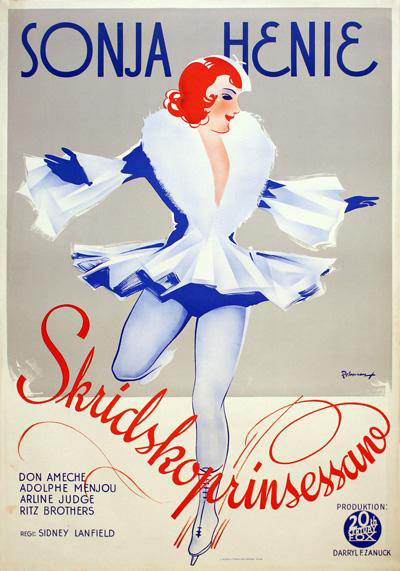 Film poster featuring Sonja Henie. Skridskoprinsessan is the Swedish word for Ice Princess. The first Ice Princess bronze was cast in 1949, making it a relatively late Milles sculpture. Stockholm’s Millesgarden attributes the design to a 1948 visit to Rockefeller Center in New York City. As the story goes, Milles was so fascinated with the skaters he saw at the Rockefeller ice rink, he designed the Ice Princess to match their fluidity and movement. The Ice Princess in the Fisher Cummings Courtyard at the Cranbrook Kingswood Girl’s Middle School. Photographer, Craig Hoernschemeyer. There are more than 100 Milles sculptures across Cranbrook Educational Community’s campus. 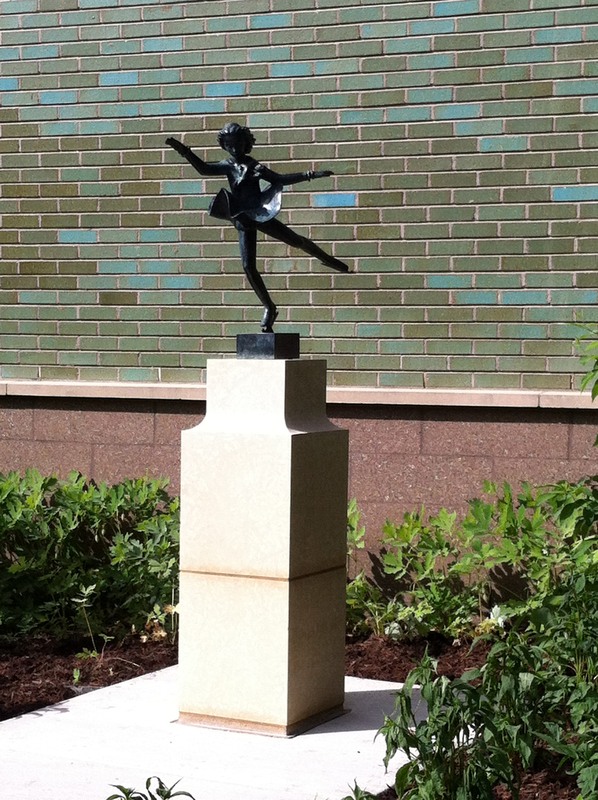 The Ice Princess was cast at the Herman Bergman AB foundry in 2012 and was installed in 2013 in the Fisher Cummings Courtyard at the Cranbrook Kingswood Girl’s Middle School. Rockefeller Center? Sonja Henie? What do you think?